Terry Wogan - who sadly died on 31st January 2016 - first commentated on the Eurovision Song Contest for BBC Radio in 1971. He went onto do the television commentary for BBC One in 1973 and 1978, as well as some radio commentaries in the intervening period. From 1980 to 2008 he did the BBC television commentary every year, as well as being the co presenter of the Eurovision Song Contest in 1998. In addition he was frequently the presenter of the United Kingdom finals between 1977 until 2008. 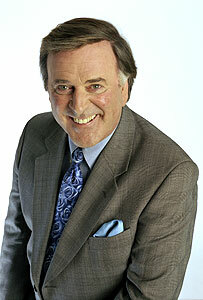 Terry Wogan stepped down as commentator of the Eurovision Song Contest after three decades in 2008. In December 2008, he talked to BBC's Newsbeat about the United Kingdom's future chances in the competition, his highlights and what advice he'd give to new presenter Graham Norton. Newbeat: When was your first ever Eurovision Song Contest? "I did the first one in 1971. I had just left Ireland and found myself working for the BBC. Then I had to go back to Dublin to do the Eurovision Song Contest for Radio 2 which was held in a tiny little music hall. Now you go to somewhere like Belgrade this year or Athens the year before and they were huge, huge arenas with thousands and thousands of people. So it's grown enormously and indeed I have grown myself." Why did you decide to stand down this year? "Why not? You've got to pick a time. Nothing goes on forever. I'd rather leave before the public gets tired of me or I get tired of doing it or the Eurovision Song Contest refuses to have me anymore. But I've had the most enormous fun, it's been fantastic and I can't say a bad word about it. I've been to places I'd never have gone, I've heard the kind of songs I never thought I'd hear. It's been fun from beginning to end and I've absolutely loved it but everything comes to an end. Only the river goes on forever." I remember you criticising this year's competition after all the eastern European countries voted for each other. Was that part of your decision to leave? "I suppose it was. I did put up a signal saying that I probably thought it's time to go. But I don't think it's time for us not to take part in it. We should continue, we have to be part of Europe as far as that goes. I would like to see the United Kingdom do an awful lot better. But I don't want to go on presiding the United Kingdom entry coming last or second to last. I was getting a bit tired of that to be honest. It will probably be all different this time. Because there is a change and Lord Lloyd-Webber is flinging himself into it to find a singer who can really stand up for the United Kingdom while Graham Norton, who is a perfect choice, will be doing the commentary. So it is an appropriate time for me to go." What is the main reason for you leaving? "I've always been reasonably good at folding my tent at the appropriate time. I gave up Blankety Blank when I felt I'd done it enough. We have all got our exits and our entrances. It is very important to get your timing right. If you're lucky with your entrance as I have been in this business, then people will want you. You also have to get off the beach before the tide goes out." With Andrew Lloyd Webber getting involved this year, was that not enough to make you want to stay? "I couldn't see that I could play any major role in that. It's Graham's show. He does it with Lloyd Webber. I would be superfluous to it. The only thing I could have done was perhaps to do the commentary. Perhaps that was why I was so successful, nobody ever saw my face. I might have been the kiss of death to Lord Lloyd Webber's efforts." What do you think of the past few entries? "I helped to pick Andy Abraham and I actually forced the issue. He should have done a great deal better but the problem is, as I have said before, everybody knows that since the eastern European countries came in, what I've always said is, we won the Cold War but we lost the Eurovision because as soon as the wall came down so did the iron curtain." So we now have a musical curtain dividing Europe which is virtually the same because eastern European countries have very little in common with our musical traditions. When we say they vote for each other, apart from the fact they are conditioned to vote for each other and their neighbours and to make sure everybody is happy, it is also the fact they have a musical identity that they share. The fact is eastern Europeans are putting their major stars to sing the songs so the votes are coming in. "I've said it before, I think our best chance of winning would be if one of our major stars who are known all over Europe and the world like Take That [pictured left], Boyzone or Robbie Williams took part. But none of them are willing to take a chance on being beaten and you can't blame them because they might feel that this is a terrific blow. But that's our best chance. We have to be able to compete at the same level as the eastern European stars. I think that would make a difference." Do you think it is possible for a British star to win this? "Yes it is. Why not? If the star is big you would certainly get the vote. But you can't expect Take That to sing our Eurovision entry and then come fifth. That's the United Kingdom's problem. We have all these wonderful big pop stars but none of them are willing to put their head above the parapet and take their chances with the Eurovision Song Contest." What is your most memorable moment over the last 35 years? "It has to be Abba [pictured right], hasn't it? There were lots of good songs but Abba was the one with Waterloo. I remember being there. I was doing it for radio and we had a caravan outside in a tiny little place where it was being done and Abba came into that caravan to be interviewed by me for the radio. The TV producer who has remained a friend of mine, pulled all the lights, so we sat there in the dark, all the power gone. That was my chance to interview Abba and it went up in smoke." What is your advice to Graham Norton who is taking over? "I would say have a stiff drink probably after song number three." What are you going to be doing on the night of next year's competition? Are there going to be tears in your eyes? "There probably will be but I shall fight the emotion and really enjoy it. It's great, everybody loves it, don't they? In the old days people used to complain and say it's not musically very good and then around the 90's people went, 'Hang on it's not a music contest it's just a bit of spectacular wonderful fun'. And that's the spirit we should approach it in. I'm sure that's the spirit Graham will approach it in. He'll have great fun!" ABBA at The Eurovision Song Contest 1974 - Terry Wogan's "most memorable moment"